Danny Dwyer, organiser of Bear-Patrol, celebrated his birthday with friends at the Amsterdam Bar and Kitchen on May 19, raising in the process an impressive total of £2,206.95 for local good causes. DANNY asked friends attending not to buy birthday presents or give him cards but rather to make a donation to his JustGiving Fundraising page to raise money for the counselling service at MindOut, the LGBT Mental Health Service, which raised £1,465. A further £741.95 was raised from a raffle for the Rainbow Fund, who give grants to local LGBT/HIV organisations providing effective front line services to LGBT+ people in the Brighton & Hove. 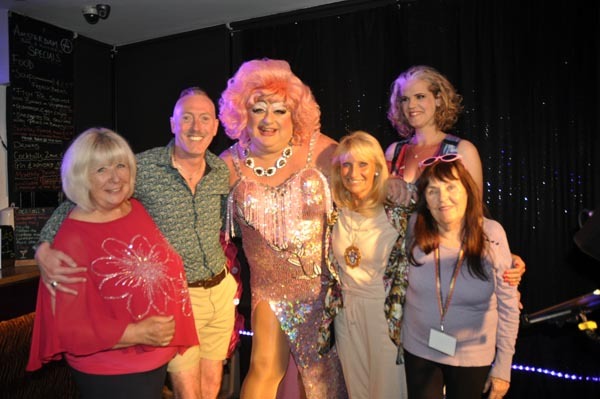 The Mayor of Brighton & Hove, Cllr Dee Simson, was in attendance and entertainment was provided by Dave the Bear, Davina Sparkle and Jennie Castell who hosted the evening. Since Danny started Bear Patrol in May 2008, they have together raised a total of £193,472.23 for local good causes. They hope to push the figure over £200.00. after this years Hibernation Community Luncheon on Sunday, October 21 at the Old Ship Hotel.